For seven years, Alyssa has been by Lord Dillon's side, counseling him from the shadows, healing him with her hands, and staving off the worst of his loneliness while his fearsome reputation keeps others at bay. Blessed--or cursed--with gifts that label her a sorceress, she is forced to conceal her youth and the love she harbors for him beneath umbral robes that lead Dillon and his people to believe she is the same aged wisewoman who served his father. All is revealed, however, and passions flare when an enemy threatens Dillon's life and Alyssa sacrifices everything to save him. When Dillon discovers that the wisewoman is far from elderly, he is instantly entranced. And, as he and Alyssa work together to defeat an enemy bent on destroying them both, Dillon will risk anything--even the wrath of his king--to be with her. 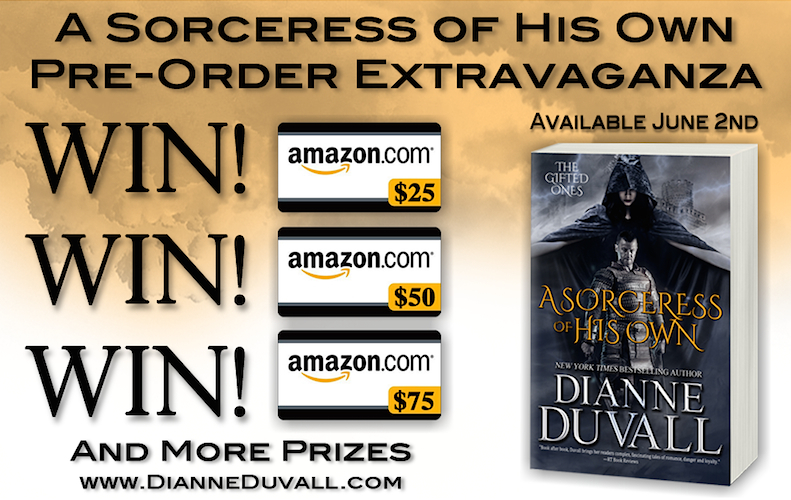 I am so thrilled to be a part of the pre-order blog tour for Dianne Duvall’s A Sorceress of His Own, the first in The Gifted Ones series. I can’t wait to read this one. Seriously. Might have to break my new year’s vow not to buy more books. There’s also a fabulous giveaway going on, so be sure to check it out! Thank you for hosting Dianne today. I hope that you enjoy A Sorceress of His Own (June 2nd)! You’re so welcome – I’m looking forward to this series! Yes, thank you, CJ! I hope you’ll like the new series! A Sorceress Of His Own sounds excellent and the cover is great. I look forward to reading it. Thanks! Right? I can’t wait to read too – thanks for dropping by, Ty! Thanks, Ty! I hope you’ll enjoy it! I really need to try her out. They always sound so good! I’m in the same boat, Anna – I keep seeing her books and thinking how awesome they sound, but I haven’t read any of them…yet. I’m putting this one on my birthday wishlist so I can avoid breaking my vow and still get what I want. 😀 If you give any of my books a try, I hope you’ll enjoy them! From all the fun excerpts I’ve read, I don’t think that will be a problem, Dianne. Ooh, me too, all the darkness and cloaks and medieval deliciousness. Good luck!